Hello! I would like to walk you through a battle that I fought in the past with insecurity and inadequacy. Be encouraged, ladies, freedom is within your grasp because our God is the Faithful Deliverer. You are not alone! I am standing in front of my bedroom mirror. In my full-blown examination attitude, I inspect myself from head to toe. Frustration rises as each of my flaws are still boldly announcing their presence. I gaze at my face: my smile that I wish were bigger, my eyes that I wish were larger and rounder, and my forehead that I wish would shrink. If only I could thin my face out ... I internally muse. I see my body, a textbook definition of lanky. Many times I concur that lanky - ungracefully thin and tall - is how I am. In my words, I am awkwardly stretched out. (I'm telling you, sometimes I wonder if I don't have an lost twin who is a pole ...). As I am looking into the mirror, inadequacy reigns supreme. Inadequacy, my life's magistrate, dictatingly reaches much beyond my physical appearance alone. It reaches past my feelings of being physically not "good enough" for people's notice and makes me wholly insecure, not confident or assured; uncertain and anxious. In my un-confident state, I doubt whether the rest of me is "good enough" either. I am looking in the mirror and feeling enormously inadequate and insecure in who I am. Yet, then, in my heart, I hear a whisper: You are chosen. This thought releases a sensation that courses through me in a rush of cool relief. The thought of having someone want me and someone choose me because they see something good, valuable, and precious in me is powerfully inviting. For, I am steeped in inadequacy and insecurity. Yet, I know these very things need to be broken. The words echo forcefully in me: You are chosen. You are valued. You are loved. I am turning from the mirror and stepping away from my reflection. 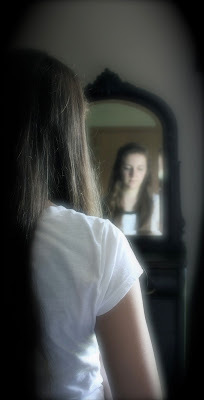 Because this inadequate image that infuses me with insecurity is just that: a reflection. "For now we see only a reflection as in a mirror; then we shall see face to face. Now I know in part; then I shall know fully, even as I am fully known" (1 Corinthians 1:12). this was so I may be His. He died that I may live and live life to the full, rid of inadequacy and insecurity (John 10:10). and to come to Him having all cast off and being dead, broken, surrendered, and open to His will. Then, I receive life in the most joyful and energy-giving meaning of that word. "But He said to me, 'My grace is sufficient for you, for my power is made perfect in weakness.' ... For when I am weak, then I am strong" (2 Corinthians 12:9a,10b). "I can do all things through Him who strengthens me" (Philippians 4:13). With inadequacy transformed into a healthy dependence on Christ, I am freed. My insecurity is transformed into my true identity, a daughter of the King of Kings who is hidden in Christ. "Who am I, that the Lord of all the earth/ would care to know my name/ would care to feel my hurt?/ Who am I that the Bright and Morning Star/ would choose to light the way/ for my ever wandering heart?" Casting Crowns "Who am I"
So long inadequacy and insecurity. I am wonderfully God dependent. I am secure in who I am: Christ's. I am valued. I am loved.